Making your own homemade vanilla extract is not only easy to do, but the vanilla you extract smells and tastes wonderful and the beans can still be used once you're done! Bottled up, this homemade vanilla extract makes a perfect holiday gift for friends, family, neighbors and coworkers. Split each pod lengthwise with a sharp paring knife, keeping the tip in tact and the seeds in the pod. 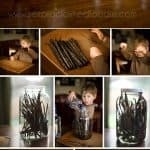 Add split pods to clean empty gallon sized glass mason jar. Tightly screw on lid. Carefully shake contents of jar. Store in cool dark place. Shake contents of jar weekly. Allow 6-12 months for flavors to properly develop. Use fine mesh filter to separate the liquid from the solids. Use funnel to pour into 24 separate 4 ounce amber Boston Globe glass bottles.